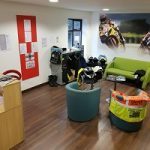 Q & A sessions with a DVSA Qualified Motorcycle Instructor with 15 years Teaching & 40+ years Riding experience. Also Bike Reviews, Product Reviews, Tutorials and Demonstrations of all that we are able to offer. Check out some examples below or visit the channel here.
" enjoyed every single part of the day! I would 100% recommend RJH to anybody like myself that has never rode a moped before! Fantastic day & a fantastic instructor!!" "Just finished my CBT training. Fantastic experience and supportive instructors." "Passed DAS Mods 1&2 FIRST TIME with these guys! Absolutely amazing group! You will not find instructors more positive, welcoming and supportive than RJH." "Fantastic experience, from arrival to the end passing my CBT and hopefully future training for my full license." 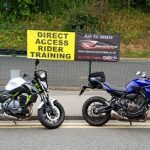 "A great day with the guys at RJH motorbike training on Friday, very well looked after by Graham and Rob who have the patience of a saint to get me through my CBT! " "Great place to learn and great people. My son jordan did his cbt last saturday and passed, his words was "Really enjoyed my training and it was made easy thanks to my trainer Ian! " 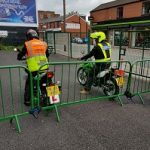 "Passed my cbt today with my dad what can I say from start to finish what a brilliant day a big thank you to graham the instructer such a nice bloke with great experience." we are a full motorcycle dealership with 5 star facilities offering Kawasaki, Yamaha, Suzuki , Royal Alloy, Lambretta, Royal Enfield, Sym, Hanway, Mondial. We pride ourselves with professional training standards backed up by our instructor training reports from the DVSA. We only ever train up to 2 people on all elements of the CBT, giving you more time to learn to ride. We are never in a rush. We use the actual Module 1 area for training, this is where you will take the actual test. All our motorcycles/scooters are serviced every month, our bikes are no more then 1 year old.
" Done my CBT with instructor Martin top bloke and a gentleman, very experienced and got me to where I am now." "Excellent service,friendly staff what more could you want." "Thank you for helping me complete my cbt. Nice easy training.staff was brilliant kind/understanding and easy to get on with to complete your cbt"
"Huge thanks for today, my son. He couldn’t praise you enough for all your help, you’ve given him so much confidence! If anyone is considering booking I would highly recommend booking in with you. " "Brilliant Day, couldnt ride to begin with then picked the riding part and had a great day, Cheers Martin and Ash"
"Had a free CBT with the Scooter my dad bought for my 16th, learnt alot and was great fun, rode home on it. " "My 3rd CBT with Martin, Brand New Yahama YS 125 and great fun as allways"